To him that sings so clear. Will make a household merry." Editor's Note: Husk was referring to When Bloody Herod Reigned King, verse 6. Also found in Thomas Wright, Specimens of Old Christmas Carols Selected from Manuscripts and Printed Books (London: The Percy Society, 1841). Wright noted that it was from "New Carolls for this Mery Time of Christmas," 12 mo. Lond. 1661. This carol is printed in the "Archæologist," No. 1. It was sung to the tune of "Essex last good night." Also found in William Sandys, Christmas-tide, Its History, Festivities and Carols, With Their Music (London: John Russell Smith, 1852), pp. 233-4, who notes "Sung to the Tune of 'Essex Last Good Night.'" At the Restoration, Christmas Carols once more came into fashion. The following pleasing little composition is extracted from "New Carrols for this Merry Time of Christmas," 1661. Also found in Edith Rickert, Ancient English Christmas Carols: 1400-1700 (London: Chatto & Windus, 1914), p. 238. She also gives her source as “New Carolls for the Mery Time of Christmas,” 1661. The Ashmolean Museum (Anthony Wood's Collection) contains several rare little tracts, appertaining to the present season of the year, which are worth treble their weight in gold. 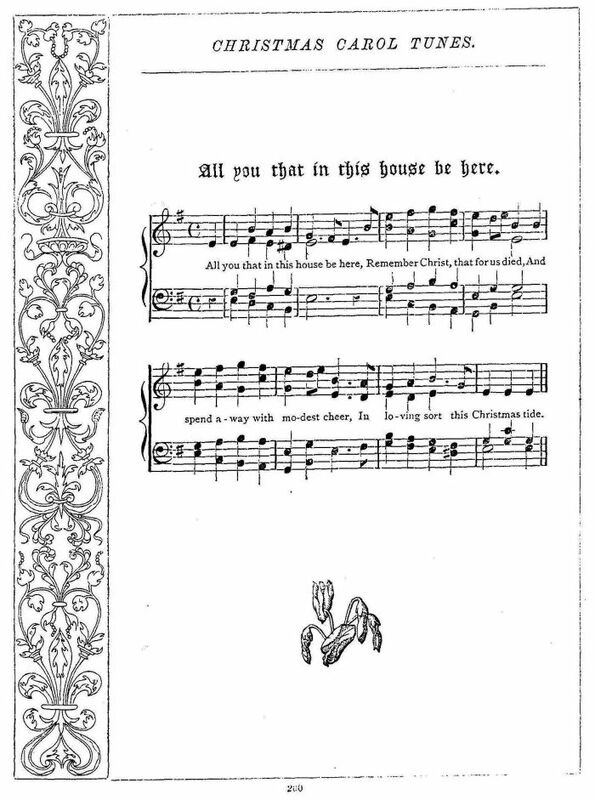 Among them are The Examination and Tryal of Old Father Christmas, 1655; Christmas Carols, 1642; New Carols for this Merry time of Christmas, 1661; Christmas Carols, fit also to be sung at Easter; New Christmas Carols, 1688, &c.
"All you that in this house be here ..."
He included all ten verses. Dr. Rimbault published A Little Book Of Christmas Carols in 1847, although he did not include this carol.